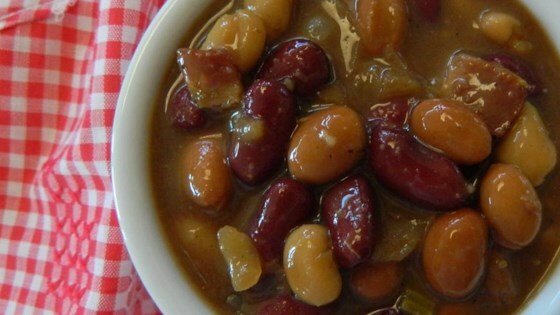 "Even people who don't particularly like baked beans love this one. Best of all it's easy and quick to make." Cook sausage and onions in a skillet until sausage is browned. Drain excess fat. Add to browned sausage: baked beans with pork, mustard powder, brown sugar, white sugar, ketchup, barbeque sauce and Worcestershire sauce; mix well. Pour into a casserole dish and bake 40 to 50 minutes. This recipe was way too sweet for our taste. If I were to make it again I'd probably omit the white sugar and either the ketchup or BBQ sauce. Followed recipe exactly.Easy to make and very tasty.